Last night at our January CJMQG meeting, we celebrated the holidays and held our annual Secret Quilter Gift Exchange. 19 members signed up to make something for a secret partner. It's my favorite meeting of the year! I love creating something for one special person in the guild. This year, my secret partner was Linda B. 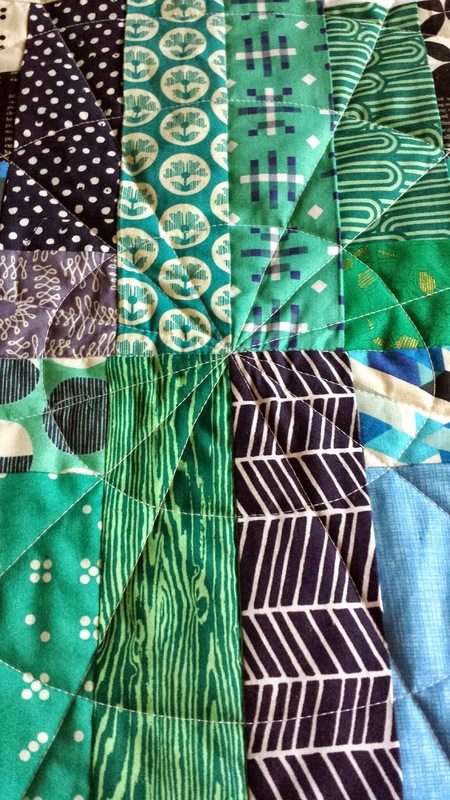 She loves blue and green, and her Pinterest board told me she likes the look of modern traditional quilts and low volume. I had already been playing with log cabins for this pillow - thus, a new log cabin creation was born. It doesn't help that there's a #scrappylogcabinqal on Instagram - I'm hooked! I call this mini "Roulette" because of the quilting - circles and spokes, like a game of roulette. I was craving a different kind of circular pattern than a spiral from the middle. I put my walking foot to work for all of the quilting. I marked the lines but not the circles; I just went for it and it worked out! It's nice when that happens. :D It's bound in gray/black Pearl Bracelets, some solid gray, and sparkly Netorious from Cotton and Steel (I use this fabric all the time and just bought another yard last night. And before you scold me - I had a birthday gift card :) I seriously can't get enough of that sparkle!). On the back, I combined two blue prints that seemed to go nicely together. 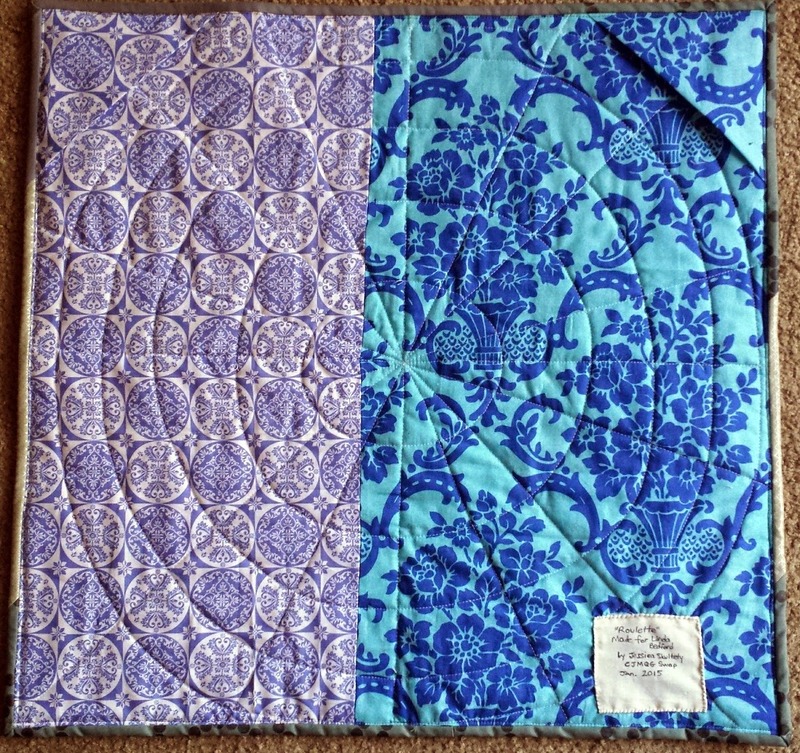 I paired them with two somewhat-invisible corners so Linda can hang it up easily. 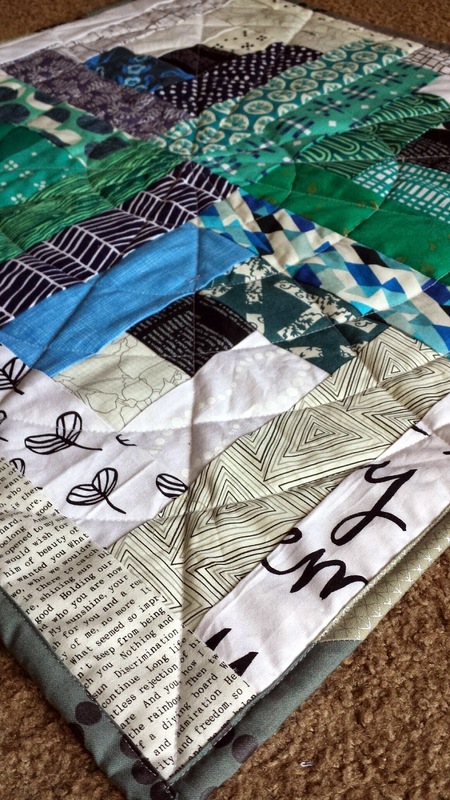 Here's Diamond in the Rough, my mini quilt for Amy last year (and what she made me!). I love the family we've created in our guild. :) I'm excited to announce that I was voted President again for this year (I ran against myself, but still excited)! I have so many ideas and plans for our guild - I can't wait to get together with our board and plan for the year. While I'm on the topic... have you seen my post about Why You Should Visit Your Modern Quilt Guild? This mini is lovely! 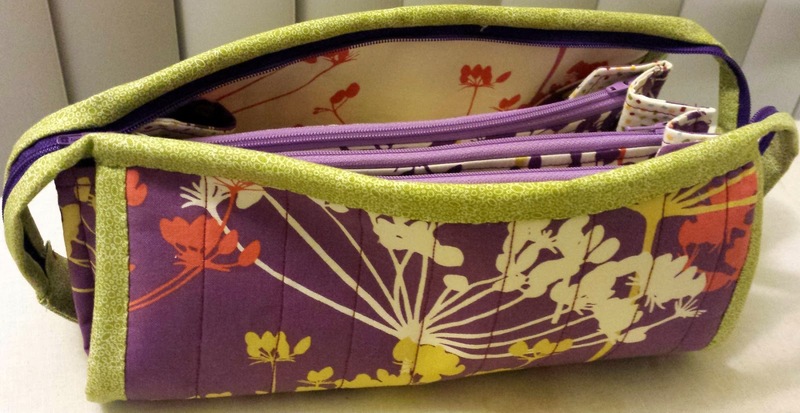 The colors and fabrics all work really well together, and the quilting turned out great! Love the lines with the circles. I love the mini and I have also been drawn into the scrappylogcabinQAL on Instagram! Found you from the Needle & Thread Thursday linkup. 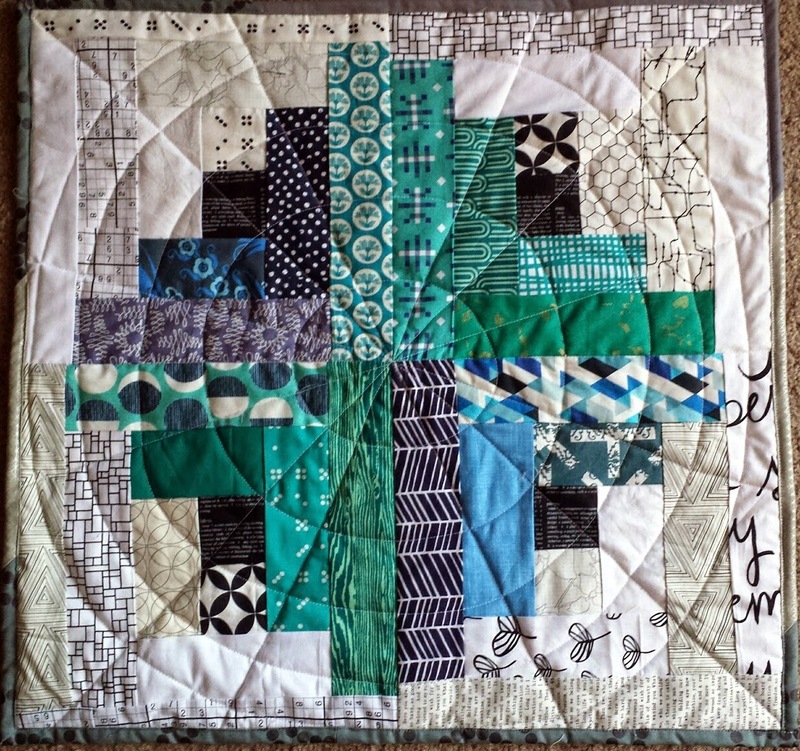 Great quilt and I'm loving your blog! Perfect name for your mini! Its so pretty! Love the bag too. 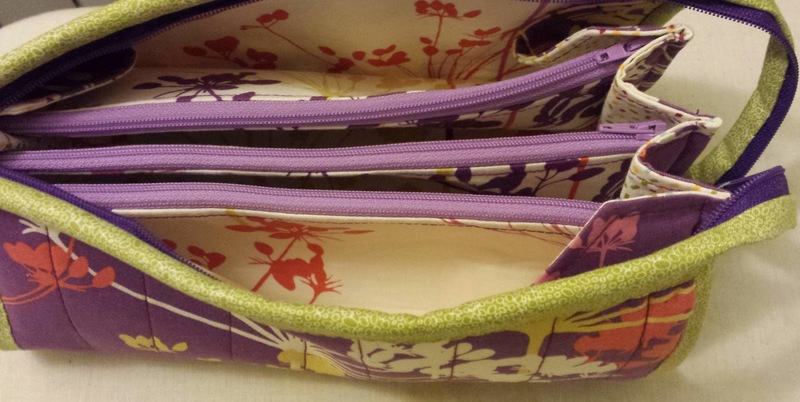 I just finished the Bionic Gear bag...that was a workout! That is a great mini. I love the colors. I want to make a mini like yours!!! Looooove the colours!! What a great post! Your mini is lovely and your guild sounds like a blast! 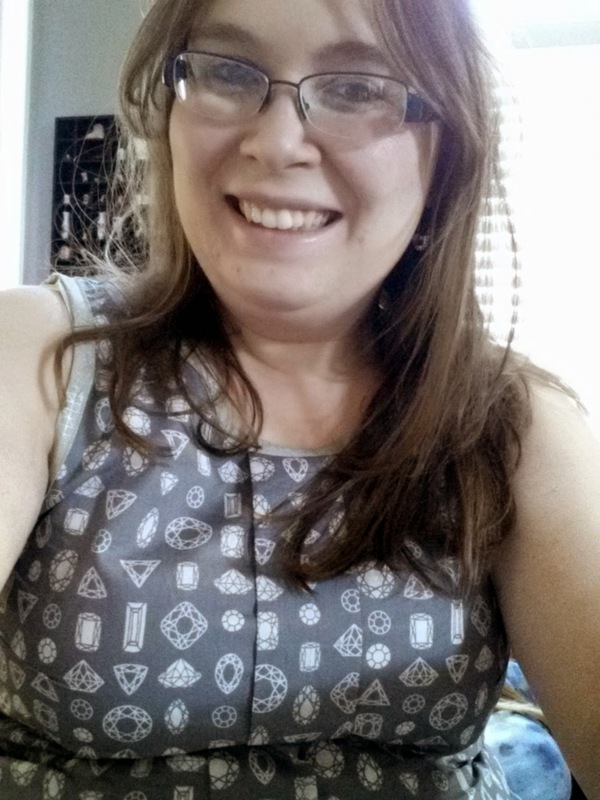 Last year I joined our local modern quilt guild and I love it. It sounds like you guys have as much fun as we do. Great job stepping up to be president. I especially like the collection of print fabrics in your mini!! Your mini is fabulous and that bag! Wow, it looks perfect!! And about your being voted in president. . . I'd say you had some pretty stiff competition ;) Congrats! That's such a cute mini AND a cute top. I can't blame you for wanting more of that sparkle, I'd probably have "accidentally" bought extra yardage too. Lovely gifts, given and received. And your top looks good!